With limited funding streams, complex approval and regulatory processes, and lengthy construction timetables, cities are often challenged to deliver the results that communities demand as quickly as they would like. Interim design strategies are a set of tools and tactics that cities can use to improve their roadways and public spaces in the near-term. They include low-cost, interim materials, new public amenities, and creative partnerships with local stakeholders, which together enable faster project delivery, and more flexible and responsive design. Whether setting a parklet along a curb, pedestrianizing a narrow corridor, or redesigning a complex intersection, cities have the opportunity and the responsibility to make the most efficient use of valuable street space. An interim design can serve as a bridge to the community, helping to build support for a project and test its functionality before going into construction. References for Interim Design Strategies: 25 found. National Center for Chronic Disease Prevention and Health Promotion. "Active Transportation Spotlight: San Francisco Sunday Streets." Division of Nutrition, Physical Activity, and Obesity, Centers for Disease Control and Prevention, Atlanta, GA.
Atlanta Bicycle Coalition. "Atlanta Streets Alive!." Atlanta Bicycle Coalition, Atlanta Bicycle Coalition, Atlanta, GA.
Lyons, Karen. "Blue Cross Expands ‘Open Streets’ Events to Seven Minnesota Communities in 2012." Blue Cross and Blue Shield of Minnesota, Blue Cross and Blue Shield of Minnesota, Minneapolis, MN. Azcona, Alaine & Ashley E. Rodgers. "CicLAvia Welcomes Angelinos to Play in the Streets at LA’s Biggest Block Party." CicLAvia, CicLAvia, Los Angeles, CA. Pratt, Liz. "Divisadero Trial Parklet Impact Report." San Francisco Great Streets Project, City & County of San Francisco, San Francisco, CA. Montes, Felipe et al. "Do Health Benefits Outweigh the Costs of Mass Recreational Programs? An Economic Analysis of Four Ciclovia Programs." Journal of Urban Health: Bulletin of the New York Academy of Medicine 89(1), 153-170, New York Academy of Medicine, New York, NY. Brennan, Kristin. "Farmers’ Market Manual." The Food Project, The Food Project, Lincoln, MA. Mollot, Sabina. "Flatiron Street to Become Pedestrian Plaza." Flatiron BID, New York, NY. Dai, Danielle. 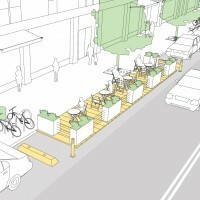 "From Parking to Park: Transportation Impacts and Value of Parklets." Congress for the New Urbanism, Chicago, IL. Greco, JoAnn. "From Pop-Up to Permanent." Planning magazine, American Planning Association, Chicago, IL. New York City Department of Transportation. "Measuring the Street: New Metrics for 21st Century Streets." Department of Transportation, City of New York, New York, NY. Birdsall, Michelle. "Parklets: Providing Space for People to Park...Themselves." Institute of Transportation Engineers, ITE Journal, Washington, DC. Gould, Sarah. "Parklets: Tiny Parks with Big Impacts for City Streets." SvR Design, Seattle, WA. City Design Group, San Francisco Planning Department. 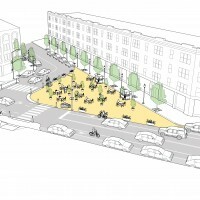 "Pavement to Parks: Transforming the Public Realm in San Francisco." Planning Department, City & County of San Francisco, San Francisco, CA. Center City Commission. "Pedestrian & Transit Malls Study." Center City Commission, Center City Commission, Memphis, TN. Ben-Amos, Ariel. "Philadelphia Parklet Program Guidelines." Mayor’s Office of Transportation and Utilities, City of Philadelphia, Philadelphia, PA.
Brozen, Madeline, & Loukaitou-Sideris, Anastasia. "Reclaiming the Right-of-Way: a Toolkit for Creating and Implementing Parklets." UCLA Luskin School of Public Affairs, Transportation Research Board 92nd Annual Meeting, Washington, DC. Pratt, Liz. "Parklet Impact Study." San Francisco Great Streets Project, City & County of San Francisco, San Francisco, CA. Pratt, Liz. "San Francisco Pavement to Parks: Parklet FAQ." Planning Department, City & County of San Francisco, San Francisco, CA. Community Design and Architecture. 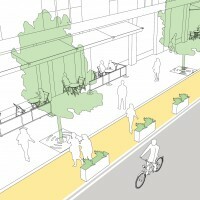 "Bergamot Area Plan: Shared Streets." Planning and Community Development, City of Santa Monica, Santa Monica, CA. Perkins+Will Consulting Team. "SF Parklet: Modular Kit of Parts - Phase I." Innovation Incubator, Perkins+Will, San Francisco, CA. Feuer, Wendy, Michael Flynn, Ed Janoff, Margaret Newman, Bruce Schaller, & Andy Wiley–Schwartz. 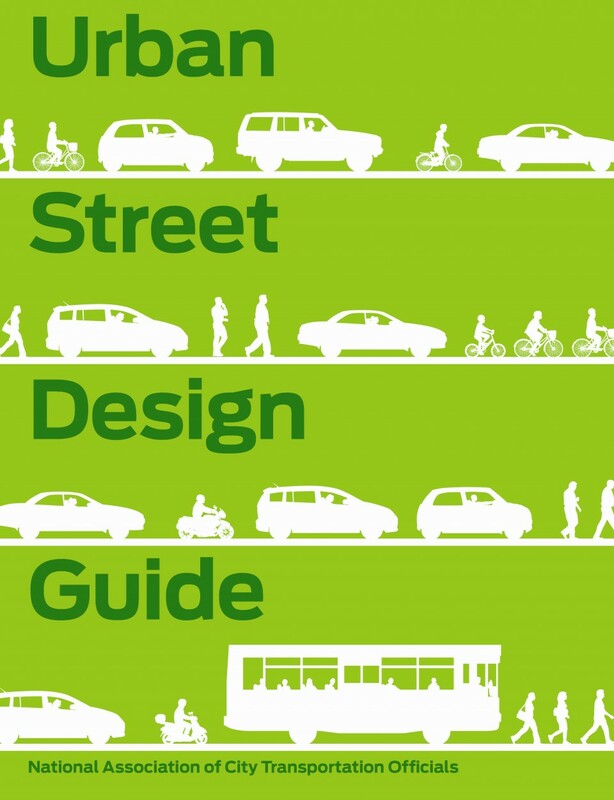 "Street Design Manual, Ch. 3: Materials." New York City Department of Transportation, New York, NY. The Street Plans Collaborative & Alliance for Biking and Walking. "The Open Streets Guide." The Street Plans Collaborative & Alliance for Biking and Walking, Alliance for Biking and Walking, Washington, DC.